Replace the chicken with prawns, lamb, beef or tofu if preferred. Prepare a pan of boiling water and add the rice, cook as per pack instructions. In a large heavy based pan, over a low heat, melt the clarified butter or heat the oil, then add the cardamom, cinnamon, cloves, coriander, cumin, turmeric and cook for 1 minute, being careful not to burn the spices. Next add the onion, garlic and ginger and fry, stirring, until it turns a light golden colour, about 3-4 minutes over a low heat. Add the chicken pieces and coat in the spices, cook for 3 – 4 minutes. Pour over the coconut milk and bring the liquid to the boil, then reduce the heat and leave to simmer, uncovered, for about 8 -12 minutes, until the chicken is tender and the liquid has reduced. Add in the yoghurt and cream to the chicken mixture, and heat through gently, taking care that the curry doesn't boil, for about 4 minutes. Be very careful at this stage as if the yogurt does boil it will split, leaving you with a curdled mess. 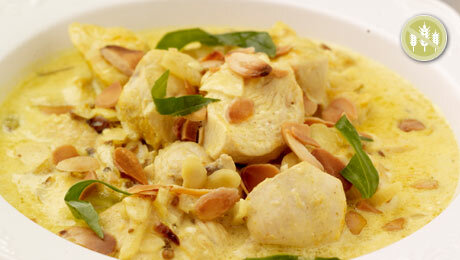 Sprinkle over the toasted nuts and chopped coriander, and serve on a bed of basmati rice. *Check Coeliac Society of Ireland Food List for gluten free brands.